We are always up for spontaneous side projects as was the case when getting involved in the 2015 PDN / Samsung 4K Filmmaking Challenge. We sent a link earlier this summer to the recently finished JCP short film "NYC Is Handsome,"as our initial entry. After just enough time had passed to forget about the contest, an email arrived congratulating our team for making it to the final round. A few days later a box arrived with a (yet to be publicly released) Samsung NX500 camera to shoot a 4K film as part of the final stage of the contest, a film that would ultimately be judged amongst the 9 other finalist filmmakers. The deadline was coming up fast and we worked up a concept that we could fit in between our regular shooting schedule. The film was shot in an afternoon, an hour outside of Minneapolis on a horse farm with a rider to round out the vision. Although it was a lightning fast project, we were eager to take part and enjoyed the challenge of working with on a quick deadline with a camera that hadn't yet hit the market. 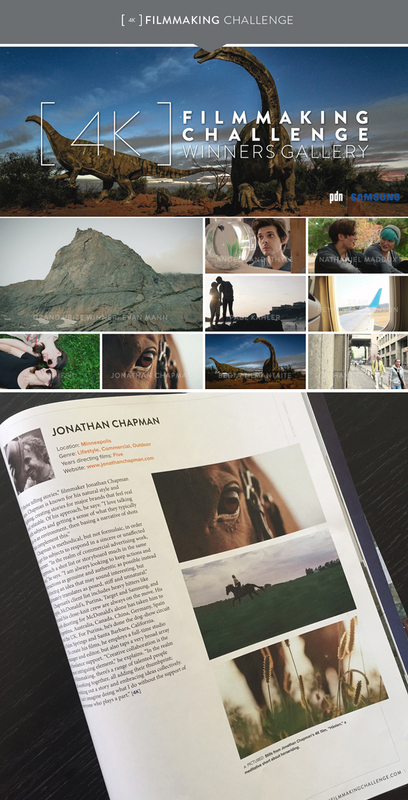 Our film Hästen, which is Swedish for horse, didn't take the blue ribbon, but was featured as a finalist in the latest issue of Photo District News amongst a talented pool of photographers and directors.